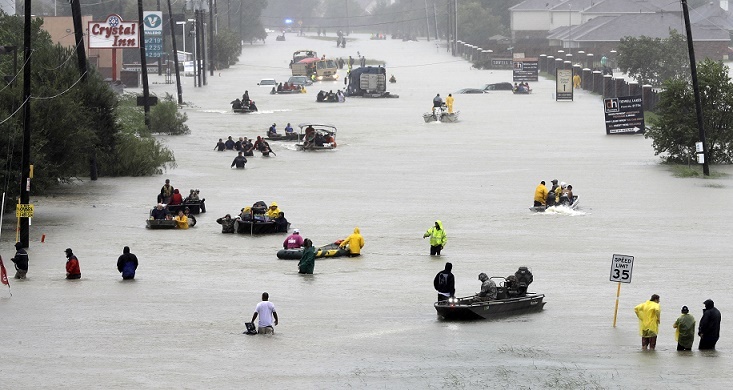 HOUSTON (CN) – Hurricane Harvey triggered dozens of toxic releases from Houston chemical plants and refineries, and officials say the public health risks are unknown due to Texas’ industry-friendly rules that left it up to companies to report such incidents. Nearly seven months after Harvey struck greater Houston, home to 500 chemical plants and 10 refineries, federal regulators have investigated only “a handful” of the more than 100 toxic releases caused by the hurricane, the Houston Chronicle and Associated Press reported Thursday. Before Harvey hit the area in late August, Texas Governor Greg Abbott announced that companies would not be held liable for storm-related pollution. He also suspended record-keeping rules for environmental contamination. The Texas Commission on Environmental Quality, the state’s pollution regulator, told the news outlets it has investigated 89 Harvey-pollution incidents, but it has yet to issue any sanctions or fines. The TCEQ’s chairman Bryan Shaw told state lawmakers in January he could not publicize Harvey chemical and oil spills until his staff finished reviewing them, according to the news report. “The public will probably never know the extent of what happened to the environment after Harvey. But the individual companies of course know,” said Rock Owens, Harris County’s lead environmental attorney. Two highly publicized incidents – chemical explosions at an Arkema plant northeast of Houston that sent first responders to the hospital with lung damage, and damage to a protective cap over a Superfund site submerged by the San Jacinto River and filled with cancer-causing dioxins – overshadowed numerous other Harvey-triggered pollution crises, according to the report. The largest unreported spill came from ExxonMobil’s 3,200-acre refinery and chemical-production complex in Baytown, an eastern Houston suburb. According to the Chronicle and AP article, 457 million gallons of storm water, mixed with oil, grease and wastewater, spilled into a nearby creek, which, like all the area’s waterways, is a tributary of Galveston Bay. In the days after Harvey jogged east out of the area, leaving Houston to survey its damage, Magellan Midstream Partners reported to the U.S. Coast Guard that 42,000 gallons of gasoline had spilled from its oil-storage tank farm in east Houston. Ten days later, the company revealed that the spill was actually 460,000 gallons, according to the AP and Chronicle report. Magellan’s workers evacuated due to the risk of an explosion, but area residents learned about the spill a week later from media reports. Firefighters sprayed foam on the spill to suppress the fumes, but Claudia Mendez, 42, told the AP and Chronicle the smell was overwhelming. “I thought my husband had brought the lawnmower gas can inside,” she said. As chemicals, wastewater and gasoline fouled the Houston area’s soil and waterways in Harvey’s wake, toxins were also being released into the air. On Sept. 1, Houston air-monitoring equipment recorded the highest ozone pollution of 2017. Officials documented toxic levels of air pollution near a Valero plant in east Houston in early September, according to the report. Air samples taken by Houston city staffers around Sept. 5 found a benzene level of 324 parts per billion near the Valero plant—three times the level at which the federal government recommends using respirators, the news report states. Long-term exposure to benzene, a byproduct of oil refining, is known to cause leukemia. State investigators taking air samples near the Valero refinery on Sept. 7 reported suffering headaches and dizziness, but “found pollutants ‘below levels of short-term health and/or welfare concern,’” the AP and Chronicle reported, citing a state report. Scientists from Texas A&M and Rice University took soil samples around the refinery and found small amounts of petroleum and petrochemicals, according to the news report. The scientists believe that flooding from Harvey scoured the topsoil, sending it downstream into Galveston Bay. “That soil ended up somewhere. The net result on Galveston Bay is going to be nothing short of catastrophic,” Hanadi Rifai, a University of Houston environmental engineering professor, told the news outlets.